Winter is coming, and it’s coming quickly. The air has a chill to it, and still, sunny days like today are getting rarer and rarer. 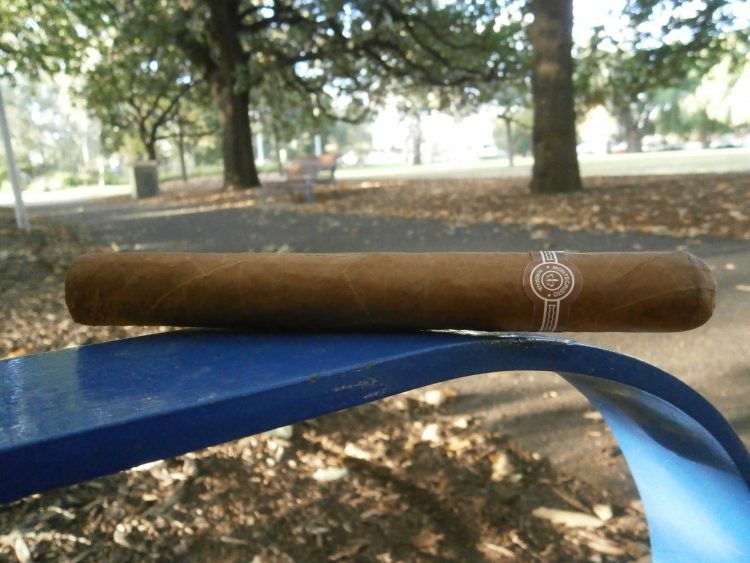 I must make smoke while the sun shines, and so I’ve come to a local park for the final entry in my retrospective of the Colección Habanos, the Montecristo Maravillas No. 1, a rare revisit of a dusky beauty. 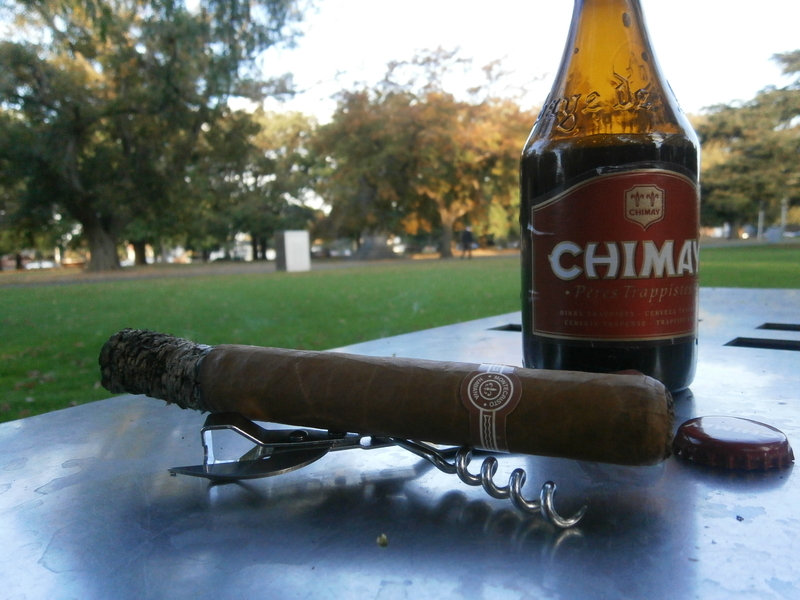 The last time I smoked this cigar – around eighteen months ago – I deemed it phenomenal, the best Montecristo cigar that I had ever had the pleasure of smoking. Now, with the Colección at my back, I’m smoking it again to see how it compares to its immediate peers. Will it live up to the memory? Almost certainly not. The Maravillas No. 1 resists the soft flame of my bic lighter* for a while, but eventually succumbs. The first puffs are fantastic, a wonderful rich coffee cream. The ash is pale, the aftertaste rawhide leather and roasted coffee beans. It is rich, yet balanced. I tend to think of elegant cigars as lightly flavoured, with a mild tobacco taste that reveals the subtleties of the leaf, but this cigar is full bodied, with a complex profile that is rich and dense, and oh so very elegant. A brief peek behind the curtain: when these articles go to print they appear as a stream of consciousness, as if written sentence for sentence during the smoking of a cigar. In some cases I do indeed write the entire article with the cigar clenched between my teeth, but in others I write only a few sentences of tasting notes during the smoking, and put in the filler later. Sometimes, for the purpose of general interest, a slight fiction is necessary, the chief example of which occurred in my last review of the Montecristo Maravillas No. 1. 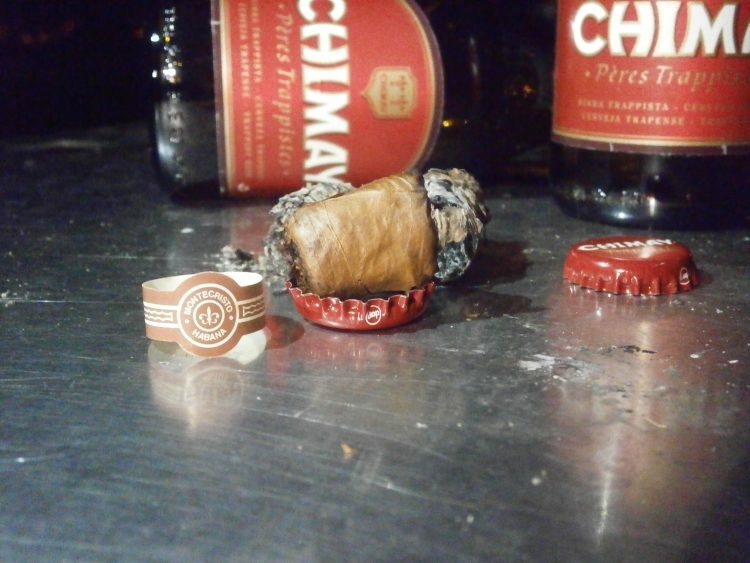 I claimed, at the time, that I was pairing the cigar with a Hahn Millennium Ale: in fact, I had drunken the Hahn a few days earlier at a New Year’s Day function, but I still had the bottle, and I deemed it too rare and interesting a brew to not mention on The Harem. The beer I was actually drinking was the beer on which the Hahn was allegedly based (and which formed the springboard for the meat of that review), a Chimay Red. In an endeavour to recreate that sublime experience, I am pairing this cigar also with a Chimay Red. It’s about as good a beer as I can imagine having with a cigar: rich but mild, with a creamy, coffee sort of taste, none of the heavy hops of many boutique beers. Around a third of the way burned and the cigar is now mild, the tobacco taste mellowed out, true coffee and cream, and a dash of powdered chocolate. I’m not sure how much of this is in my head, how much my seasoned cigar aficionado brain has learned to block out the taste of tobacco and focus only on the subtler flavours of a cigar, but to me the flavour here is indistinguishable from that of a cappuccino. It may be good, but Chimay is an expensive beer. In Australia a single bottle of beer in a liquor store will set you back generally between $3 and $4. The two Chimay Reds I bought for this review were $7.50 each. Its brother, the Chimay Blue, is even more expensive. A few months ago I walked into a high end watering hole, glanced at the bottles on display behind the bar, and casually ordered a Chimay Blue, not looking at the price list or even thinking twice about it. “That’ll be eighteen thanks mate” said the bartender. I double checked against the menu, and he wasn’t joking or mistaken. Eighteen dollars for a beer! Cocktail prices! What it comes down to is this: the Montecristo Maravillas No. 1 is not a transcendentally good cigar. It’s not going to change the way you think about cigars. It’s not as good as the Partagás 150 or the Partagás 155. I’ve never had one, but I doubt it’s as good as the 1492 humidor cigars. That said, it is at the very apex of non-transcendentally good cigars: it’s better than a Cohiba Gran Reserva, it’s better than every EL I’ve ever had, and it’s a head and shoulders above the rest of the Colección Habanos, and if anything the example I smoked today was better than the one I had last year. If you want to spend $100 on a cigar then this is the one you should buy. 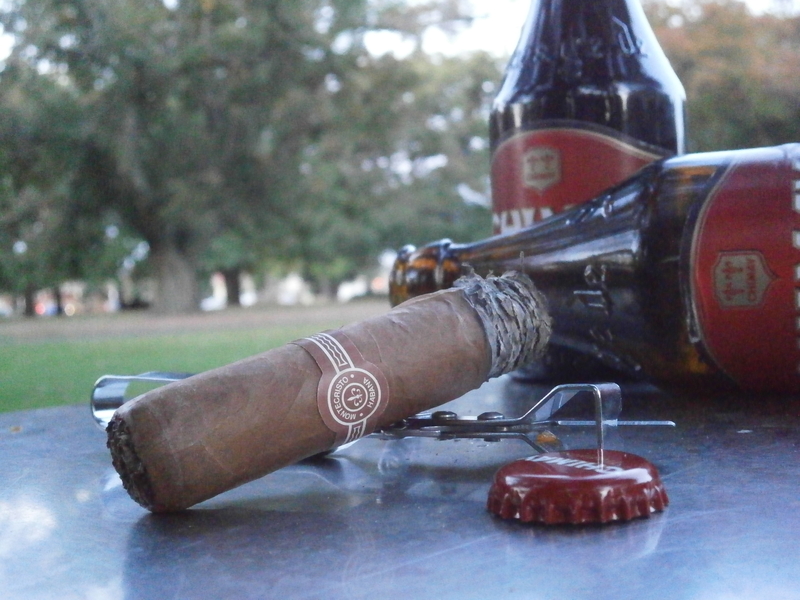 *Regular readers might recall my review of the Montecristo Millennium Jar Robusto, whose dreadful burn I lamented as having exhausted two lighters. That represented the end of my gas supply for my large collection of high quality jet lighters – over a year has passed, and it has yet to be replenished, with every dusky beauty since then set ablaze by either a matchstick or a bic lighter. Montecristo Maravillas No. 1 Colección Habanos 2005 on the Cuban Cigar Website. This entry was posted in Colección Habanos, Montecristo. Bookmark the permalink.